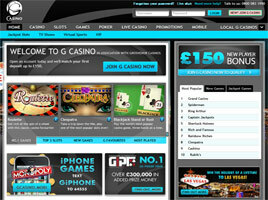 Those who are new to G Casino are eligible for up to £150 as a Welcome Bonus upon their first deposit. To qualify, each new player must open an account, deposit at least £10 or more, and play certain qualifying games. The amount of the deposit will be matched 100% up to £150. A separate Welcome Bonus is also available to new mobile phone players - a bonus that's worth £5 free just for downloading any mobile casino game. The bonus is awarded immediately upon log in via phone. Players should be aware, however, that the bonus must be played through 35 times before a withdrawal may be made. As part of the London-based Rank Group, the gaming web site known as G Casino is part of a network which includes Grosvenor Casinos, the second largest casinos business in the UK, Mecca Bingo, and eight other online gambling venues. The games here have been developed by a compendium of software specialists, including Playtech, Boss, CryptoLogic, Dynamite Idea, and WagerWorks licensed out of Alderney. The primary web site is in English, although the linked poker section is part of Playtech's French iPoker Network. Although a download version of the G Casino is available to registered players, no special application is required to sample the site's games in the "Play for Fun" mode. Here, visitors will find dozens of risk-free classic slots, jackpot slots, multi-line slots, and new TV and Movie-themed slots, such as the Fantastic 4, Sherlock Holmes, and Spiderman. The current top three progressives - Cleopatra, Monopoly, and Cluedo - have already amassed a prize pool exceeding £1.5 million. Among Table Games offered are Craps, several forms of Blackjack, two types of Roulette, and two versions of Texas Hold'Em - Bonus and Shootout. A special "Live Casino" section is also available with six female dealers providing Blackjack, Roulette, and Baccarat with chat and real-time video streaming. A number of novelty games have also been installed, such as scratch cards, Bejeweled, Deal of No Deal Jackpot, Chain Reactors, Family Fortunes, Super Discs, and more. There are two simulated race games, too, Virtual Dogs 6 and Virtual 8 Horses. In the Poker section, which requires a separate download for tournament play, there are five video poker games, including Lucky Draw Jacks or Better. Quite recently, 23 games have been added for the iPhone and other mobile devices, ranging from table games, video poker, and themed slots like Poseidon Kingdom and Trivial Pursuit to races games such as Crazy Camels and Italian Job. There is also a link on the G Casino site to a listing of Rank's land-based operations in a dozen U.K. cities, from Liverpool to London. Those who enjoy card play will want to look into G Casino Poker and download the special Poker client in order to qualify for a separate $500 Welcome Bonus. It, too, is offered as a match for initial deposits and certain playing requirements govern the withdrawal of funds. To recognise and reward loyal customers, G Casino VIP Scheme has been established as an exclusive club. It provides access to a new world of online gaming, with highly personal service, more promotional offers, and uniquely special opportunities. Loyalty bonuses, such as cash back on wagers made, are based on the previous month's play. One of the latest seasonal promotions is the "Holiday of a Lifetime" trip to Las Vegas offered from 1 August through 3 September. Everyone who plays at G Casino during that period is entered automatically in the prize draw. One lucky winner is picked to receive all-expenses-paid air transportation and a five-night stay at Caesars Palace, plus a flight over the Grand Canyon.